smartShelves lets you manage your custom shelves including nodes and gizmos in NUKE in a simple, fast and intuitive way. You can always add new nodes and gizmos, edit and delete items whenever you like - And everything is done visually without any scripting being required. smartShelves lets you manage your node shelves in a simple, fast and intuitive way. To create and edit custom shelves you usually need some knowledge about python scripting. With smartShelves you don't need to script anything at all. You can add new custom shelves and assign nodes and gizmos to them. You can also assign hotkeys for your nodes and gizmos. You can always edit and change your custom shelves. 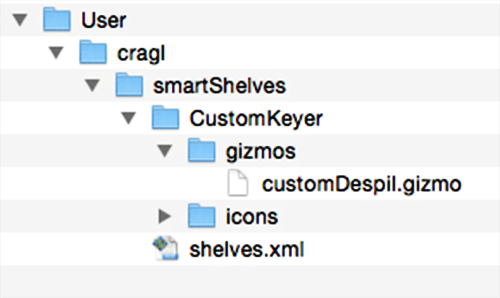 If you work on a centralized repository you can set up smartShelves with a custom gizmo path so that all gizmos in the specified directory are imported automatically on your machine. • Fixed bug that broke the settings when a setting value didn't exist. the quick edit menu can be enabled and disabled in the smartShelves window in the "advanced" section. ToeJam is a simple Mac utility application for Adobe After Effects that runs as a status bar item. When executed, it terminates After Effects® in order to force an autosave of your current working project. 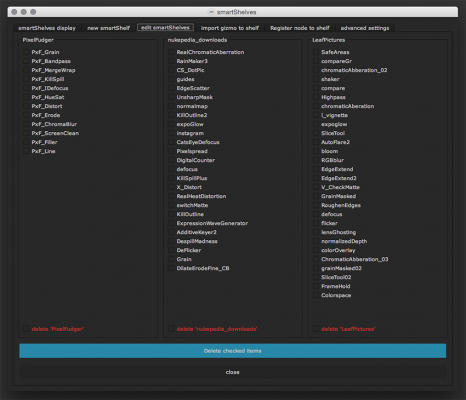 smartRender is a multi-threaded background rendering tool for Nuke. It lets you reduce your rendering times and makes final rendering and preview rendering dramatically faster compared to the standard rendering process. It uses all your hardware resources efficiently to speed up the processing. In addition you can export a detailed render log.